Tens of thousands of Fatah supporters gathered for a mass rally in Gaza Sunday, held against the backdrop of an ongoing violent struggle between the group and the rivaling Hamas movement in the last few weeks. "Hamas are murderers," shouted Muhammad Dahlan, Fatah's strongman in Gaza in his speech, "But we shall not respond with blood, but with a unity of Fatah." The rally marked the 42nd anniversary of the movement's establishment and served as an impressive show of strength for Fatah, after long months in which its members have literally disappeared from the streets, leaving control in Hamas' hands. "When I see those masses, I don't understand how we lost the elections," one of the participants at the rally said. Surrounded by dozens of gunmen, who fired in the air whenever Hamas' name was mentioned, Dahlan declared that what Fatah needed was to be united with the people. "We want to be together with the street and our people, who have come here to support us," Dahlan said." "We did not come here to speak about politics, we've come to express our united support of Abu Mazen's leadership. 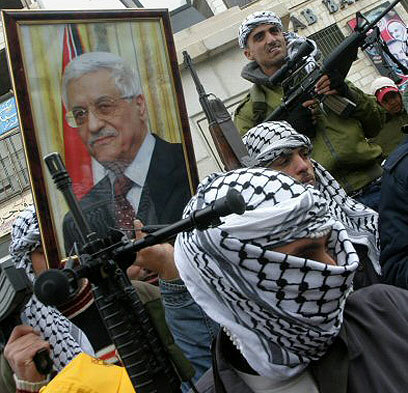 The weapons in our hands are not turned against anyone, their only purpose is to defend Fatah operatives," he stated. Dahlan said that the Fatah members will not be deterred by the attacks against them and will continue to stand behind their leadership, "Despite those who leave families without their children." Dahlan was referring to the murder of three children of a Palestinian Preventive Security Service officer in Gaza last month. The Fatah leader also appealed to his bodyguards not to come between him and the crowd, saying, "Snipers or no snipers, let Hamas shoot and kill me, I want to be close to the masses." Many posters carrying Saddam Hussein's image could be seen at the rally, which organizers said was dedicated to the memory of the movement's senior officials who were killed by Hamas loyalists in the recent months and weeks. The crowd cried, "Hamas are Shiites, Hamas are Shiites," but Dahlan said, "They aren't Shiites, they are murderers." Dahlan also warned Hamas against hurting Fatah members and senior leaders. "For every attack against Fatah we will respond twofold, if the Hamas leadership thinks it's safe from harm, it's wrong." See all talkbacks "Dahlan: Hamas are murderers"